The World Shall Be Mine! A demon gave you superpowers and it demand evil. No, not just evil - EEEEVIL! 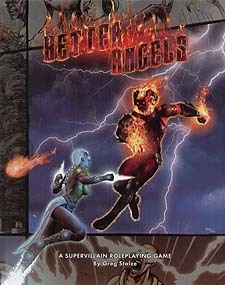 In Better Angels, you play a supervillain attempting ridiculous acts of villainy in order to control the demon that gives you amazing powers - and you play the demon for the player next to you, pushing that player's supervillain to greater and greater wickedness. Do too much evil and the demon might take control entirely. Too little, and - well, it's a demon. It will find way to punish you. Better Angels focuses on characters' moral stances. Is your villain Insightful or Devious? Are you Cunning or Patient? Is your Courage as great as your Cruelty? Those characteristics dive your superpowers. They shape your relationship with your demon and are shaped by it in every scene. AN ENTIRE WORLD TO CONQUER!